The timeline for full recovery from an ACL operation is 9 months. (1) That is 9 months until no restrictions on activity. However, this does not mean that one is under complete rest for those 9 months, quite the opposite! Indeed, post op ACL is fully weight bearing. There is no brace or cast. There are crutches but this is for stabilisation over the first 1-2 weeks and patients are encouraged to support their own weight as much as possible, as soon as possible. Likewise, rehab through physio begins from the moment one leaves the theatre and recovers from the general anaesthetic. Over the course of the next 9 months, or 36 weeks, I hope to record each week’s recovery goals and progress; lots of us have knee issues and perhaps this diary of recovery can be a useful perspective. Every ACL op and recovery will be particular to the person. The thoughts and experiences recalled in this series of posts is in no way intended as medical advice or as a replacement for seeking medical attention for any injury. This information is presented merely as a record of one person’s experience with ACL operation and recovery. (1) My experience is based on the care and approaches currently in use in the NHS; it has become apparent that other ACL-recoverers may have different timelines based on their geographical locations. There’s many ways to crack a nut and this telling is founded on the NHS-experience. Wishing you a speedy recovery, ACL tears are no joke, too many people don’t use preventative measures before their injuries (especially women, who are actually more prone to ACL injuries.) and are then understandably terrified of doing anything once the physio lets them loose post repair. Hi William, thanks for your comment! In my case it wasn’t a tear but a complete rupture. After a very committed regime of physio over 18 months I started to doubt my initial ortho’s advice to take a ‘conservative’ approach to recovery; there remained a lot of restrictions on my activity level and the knee just wasn’t right. So I got a second opinion which was very clear about the need for reconstruction due to my lifestyle and here we are. By the time I went in was about 2 years of physio, so the legs went in and came out in pretty good condition and that is definitely paying dividends now in terms of my recovery. Hugely grateful to be able to afford access to Helen at Physio in the City; she’s been brilliant in guiding my rehab. Indeed, many folk in many disciplines can be lazy when it comes to warm ups and cool downs and regular complementary conditioning which can help maintain a robust bod. Couple of the guys at my club started doing yoga over the last 6 months or so and feel tons better for it. One of them is a very VERY big and muscly man and he’s really appreciating his improved flexibility to reduce aches and pains and loosen up those muscles. Getting a good balance of activity really helps to maintain, no doubt. However, sh1t does happen and in my case no amount of extra conditioning could’ve prevented the ACL rupture. Knees don’t play well with full contact and while there’s probably more that many of us could be doing to help prevent/rehab the smaller wear and tear injuries (that can become chronic and bigger issues if left untreated), but ultimately, this is a dangerous thing that we do and not all scenarios are foreseeable or preventable. Very true especially if you happen to facing down a guy like Toquinho! My knees hurt just watching. Its unfortunate it was an injury you walked around with for sometime, expanding on my experience with clients, It seems that if you are already very strong around the knee and get the repair done immediately recovery is shortened by some magnitude (agility work at 6 months vs 9). In this case it was blatant “I can but my boot in my mouth” PCL and ACL tear, horrifying stuff. Obviously in this case it can acted on immediately! A smart and proactive physio can make the world of difference. It would be great to hear how you deal with the psychological aspects of recovery, this is part people find hardest and probably find the least amount of support available for. Looking forwards to following your timeline! Me too, Allie! Week 2 is going well and have levelled up exercises, which helps keep the mind motivated and positive. Thanks – I hadn’t realized that this could be prevented and it got me looking up prevention. Hi Juila! What do you mean by ‘this’; the op or the injury? There are exercises to do which can help make the knee more resilient to injury, but of course nothing short of omniscience can totally prevent it from happening. 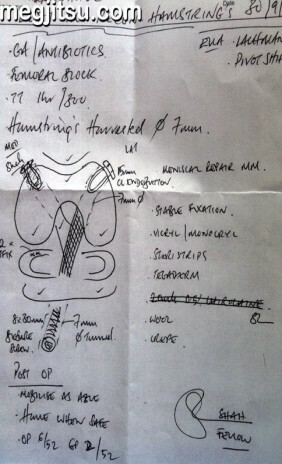 In terms of the op, that is an older perspective that is not inline with mo current medical wisdom or the NHS’s current guideline which is, essentially, if the patient is in the younger part of life, operate to avoid any wear and tear to cartilage that laxity in the limb may produce. However there is a lot of conflicting views and info that it is hard to know how to proceed and in my case, where the MRI showed all other tissues were in gat shape just a cleanly snapped ACL, the notion that I could rehab to a point where I could do all my activities without the risks of an op was convincing. Unhappily, I think my first ortho and I had fundamentally different goals for my activity levels. But all’s well that ends well!